Example One: Elijah knows when he's in trouble. Elijah loves to listen to music. We moved a small boom-box to our living room (the room he also does his ABA therapy) so that he could easily request to listen to his music. Elijah is a climber and for some reason he likes to climb on our couch and try to get above his boom-box. Apparently the sound is better up there. I'm not really fond of the climbing, but he is a billy-goat after all. Not many disciplinary techniques have worked for Elijah, but one we have used is counting down from three. If he hasn't stopped by one, we stop the behavior for him. It usually works. 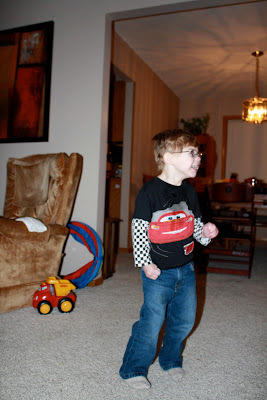 One night Elijah was standing precariously on the couch, so Andy started counting, "Three, two..." Elijah quickly got off of the couch and ran away crying as if his feelings were hurt. Andy and I looked at each other curiously. We'd never seen that reaction from Elijah before. A minute later and Elijah apparently forgot that he's not supposed to climb on the couch. So, again Andy started counting and again Elijah got down, ran away, and started to cry. It was very obvious that he knew he was in trouble and he was upset that he was getting reprimanded. It may not sound like much, but to us this reaction is phenomenal. Elijah is much more in tune to our tone of voice. That's pretty amazing for a kid who used to laugh at me when I got upset (he was responding to a change in my temperament, but wasn't understanding what the change in my emotion meant). These days, I can simply say his name in that you're-in-trouble-tone-of-voice. "Elijah James!" I'll say (yes, I'm one of those moms who say the middle name when he's in trouble) and he knows he's in trouble. Does he always listen to me and do what I want him to? No, he is a three-year-old. The point is that he knows when he's in trouble. That's a big deal. Example Two: Elijah is so much more aware of our presence. I used to be able to watch Elijah's ABA therapy without him really noticing. These days if I walk in the room, he looks at me. Sometimes he looks at me when he I'm sitting across the room at the dining room table and he's in the living room in therapy. That's pretty phenomenal. I certainly can't get away with as much which is definitely a good thing. Example Three: Elijah is continuing to expand his communication skills. Elijah will grab our hand to bring us places and to ask for help (to turn on a toy for example). He's also learned how to pull things toward himself (to tell us he wants something) or push things away (to tell us "no thank you"). Bonus: He's been screeching a lot lately. While it hurts my ears, it's awesome to hear him experiment with his voice. Example Four: Elijah is sharing with us. Elijah is constantly grabbing my hand throughout the day and evening to bring me places. Even more amazing is that sometimes he doesn't really bring me anywhere. I have to conclude he just wants me to be with him. For example, he'll bring me into the living room where music is playing, let go of my hand and start jumping around. He wants me to dance with him! When I clap my hands and start dancing too, he gets so excited. He just wants to be with us sometimes. His requests are getting more complex. A lot of little (BIG) changes in Eli. He never ceases to amaze us. Doesn't it feel so damn good!!?? All the things we had to "wait and see" about are starting to unfold. It's a beautiful thing, just like your Elijah. What an amazing little guy, Lisa. So happy for all of you!